Starbucks Corp. said Thursday it is wiping its name from one of its Seattle-area stores and adding alcohol to the menu. The Seattle-based gourmet coffee chain said it is changing the name of one of its existing stores in its hometown to a name that reflects the neighborhood location. The store will be called 15th Avenue Coffee and Tea. It will open next week and will serve coffee and tea as well as wine and beer. The company said it will then open two more Seattle-area stores without the Starbucks name in locations that aren't currently Starbucks stores. The chain said if the rethought coffee shop is a success it will consider replicating it in other cities. "It's interesting," said Morningstar analyst R.J. Hottovy, "especially since the Starbucks brand has been such an integral part of their success." 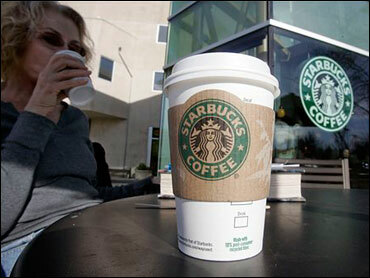 Hottovy said he thinks the Starbucks brand still "resonates" with those who drink coffee regularly. But, he added, with the recession now in its second year, the brand may be struggling more because it is considered "premium," and therefore expensive, by consumers. The company has been unable in recent months to keep its sales growing as more consumers cut out small luxuries to save money. Starbucks is slated to report its fiscal third quarter financial results on Tuesday and analysts have largely predicted another same-store sales decline, particularly, in particular, that competition with lower-priced rivals like McDonald's Corp. has heated up. McDonald's has been rolling out its own line of espresso-based drinks to all of its 14,000 U.S. locations and has been heavily promoting the beverages. Andrew Hetzel, the founder of coffee consulting group Cafemakers, said Starbucks may also be renaming its stores to provide a testing ground for changes and, possibly, to bring in a new brand of consumer. "It looks to me that they are testing a specialty sub-brand to see if they can capture some other segment of the market that would otherwise be disillusioned by a large corporate chain," Hetzel said, adding that opening only one at first "gives them a live shop to test changes in menu offerings, store design and, perhaps, procedures quickly" without disrupting operating stores branded with the Starbucks name.